The Wuhan converging war was the longest and largest scale battle in the eight years resistance war against Japan's fascist invasion of China. On June 12, 1938 Japan occupied Anqing, this started the battle. By October 27, Wuhan was conquered, this concluded the battle. In the afternoon of October 26 the Zhongshan Fleet was sunk to the bottom of the Yangtze River, which was practically China's entire navy. In early October Zhu Jiahua assisted Korea's revolution project and met with Korean interim government personnel in China. 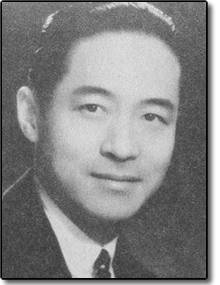 Dr. Zhu Jiahua helped the Korean independence against Japan movement and their leaders in China. America did not participate in the war until Pearl Harbor was attacked by Japan. Meanwhile China Nationalists had to instrument large scale war against Japan like Wuhan converging war. It is not that Chinese people love the war; on the contrary, it is because we fought for our peace and freedom and refused to be conquered by the Japanese military. In 1938 my two great uncles were involved in the Wuhan Battle. One was a physician, and the other a communication officer working for the central news agency. Communists may not be proud of what the Nationalists did, so we hear very little, but surely the world should not forget about this resistance against conquest war instrumentation and mankind's struggle for freedom. I once asked my great aunt why her brother went from Shanghai to Henan. Her reply was surprisingly poignant, she asked then why did your parents go to Taiwan? My paternal side of the family stayed in China Proper while my maternal side of the family moved around, as my maternal grandfather worked for the central government and the government was relocated many times. This depicts that Chinese people are plagued by war and must change locations all the time to preserve themselves. After the Shanghai defense battle in 1937, the Nationalist troops secretly migrated to Henan. They were trying to make a comeback. In 1938, they conducted a one million man battle in Wuhan. We lost many people. Both my maternal great-grandfather and paternal great-grandfather died in the 1938 turmoil. It converges on all aspects, including, intelligence (a nickname, Yantgze River 001), communications, and logistics. Japan's emperor meant to annihilate China in 3 months. Wuhan converging battle included a chain of 11 battles. 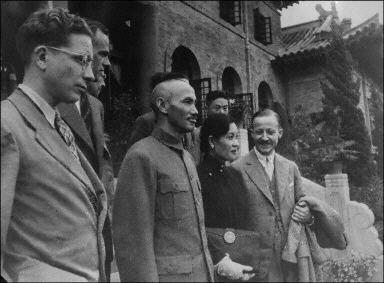 Chiang Kai-shek in Wuhan, 1938, prior to the battle. 11.12.1937 Japan attacked Shanghai, Nanjing capital was threatened, so the nationalist government relocated to Chongking. At end of 1937, Wuhan had become the de facto capital due to the city being China's industry complex. Japan military document described that Japan's army used all their resources to battle Wuhan to force China to surrender, thinking that after major cities Peking, Tianjing, Shanghai, Nanjing and Wuhan were all conquered by Japan, China would give up. But instead, China moved the capital to Chungking and continued to fight on. After Japan took over Nanjing, the Nationalist government agencies and military command center were relocated to Wuhan. So Japan predicted that if Wuhan was conquered, then this would stop China's resistance efforts. In May, 1938 Japan took over Xuzhou. The plan was to attack Wuhan with the main force along Huai River to attack Da Bie Mountain to the north. But because the Yellow River dam was broken by the Nationalists, this stopped Japan's plan to move along Huai River to attack Wuhan. So Japan changed to deploy their main troops along Yangtze River both banks to attack China. Japan's commander mobilized 11 armies along Yantgze River both sides to attack Wuhan. The other commander deployed 2 armies along Da Bie Mountain north to attack Wuhan. Navy was deployed 3 fleets and over 120 ships, with over 500 war planes. Nationalist government prepared for the war with over 1 million troops to defend Wuhan, with 200 war planes, and over 30 ships. June 9th, Nationalist had to bomb out Yellow River Dam once Kaifeng was sunk. Once Guandong was taken over, Wuhan's strategic value is gone, and to keep the country's main lifeline, the Nationalists decided to give up Wuhan. Wuhan is composed of three citites, Wuchang, Hankou and Hanyang. On 10/26 Japan attacked Wuchang and Han Kou, and on 10/27 attacked Han Yang, Japan completed occupation of Wuhan tri-city war mission. After over 4 months of battle, Nationalist suffered exhaustion in air force, and the Navy was practically gone. 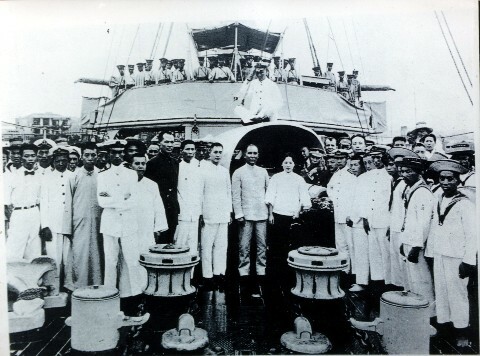 Dr. Sun Yat-sen with Soong Qing-ling on Zhongshan Fleet, 1922. Japan planned to make Wuhan a decisive battle to annihilate China's main force and force a surrender. This plan failed. After the Wuhan battle, the Nationalists shifted to the southwest region to sustain the country's sovereignty until America joined the war after the Pearl Harbor attack. The Nationalist Republic of China government, being an allied country, made great contributions to fight against fascists, and to win the eventual victory. They became one of the founding members of the United Nations. Per the secret Yalta agreement in 1945, it was arranged that when Japan surrendered, all of the land, weapons, and water resources in Manchuria would be put under the control of the Soviet military, even though they had not fired one shot or sent one soldier. The Nationalists were stopped from pursuing an official crackdown on Communist insurgents by U.S. envoy George Marshall's intervention and insistence on peace talks and negotiations. After Marshall failed, the civil war escalated, and Truman promoted Marshall to be Secretary of State, during this time he opposed sending U.S. troops to help the Nationalists. This enabled the reds to win the Civil War and eventually to take over the entire mainland, with the help of the weapons transferred from Japan via the Soviet Union, after the Nationalists had fought so hard for many years to preserve China¡¯s sovereignty. China in effect has been split since 1949, with the Nationalists having executive power administered in Taiwan, and Communists over the mainland. The Nationalists have never surrendered to the Communists, and based on the ROC Constitution, it still holds jurisdiction over the entire China mainland. Because Japan surrendered to the Nationalists, China's sovereignty belongs to the Republic of China, not the PRC. No peace talk can erase this fact.